It was obvious that eventually the Red Sox would have to make a change in their rotation. 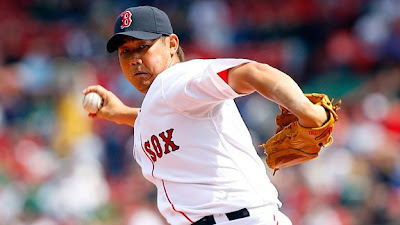 With John Smoltz healthy and ready to go and every other starter currently outperforming him, Daisuke Matsuzaka was the odd man out. This is from a Boston.com report on manager Terry Francona's afternoon press conference. "We need to get him looked at physically," said Francona. "He's gonna get looked at by (Red Sox trainer) Tom Gill. He's going to get tests done. There's a potential for MRIs. All of that information will be coming very soon." Terry Francona and the Red Sox seem to be blaming Dice-K's appearances in the World Baseball Classic for leaving him unprepared for the regular season. While he is currently only assured of missing one start I believe that the Red Sox intend to see his velocity returned to its former level and an improvement in his control before he will pitch in the major leagues again. This also takes some of the heat off the Red Sox to trade one of their rotation starters. Brad Penny has been a competent starter for the Red Sox and should continue to be as long as he stays healthy. Unfortunately this will do nothing to release Clay Buchholz and Michael Bowden from their minor league purgatory. Dice-K owners should thank their lucky stars that they won't be punished with his poor statistics for a while. I would not drop Matsuzaka if you have the ability to stash him in your reserves. Dice-K is a very talented pitcher and when he is "on" he is an asset to a fantasy team.